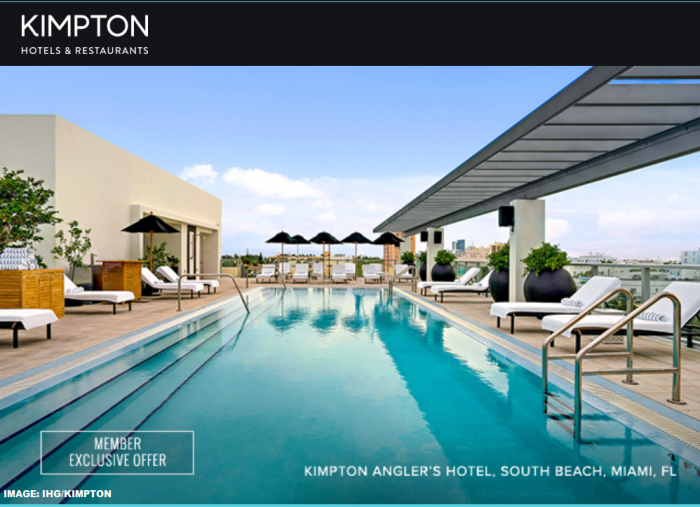 IHG Rewards Club Kimpton brand has launched double points offer that comes up to 30% off rates for stays at four participating properties in Florida. You need to stay minimum three nights through March 30, 2019 and book by December 15. You can access this offer on IHG’s website here. Kimpton has a note on the small print that the double points are not elite qualifying (Bonus Points Packages are). Welcome to the terms and conditions, a.k.a. “small print,” where we are obliged to let you know this member exclusive offer is subject to availability and valid for stays from December 5, 2018 through March 30, 2019. Offer must be booked by December 15, 2018 under this exclusive rate code. You must stay 3 consecutive nights to get the offer. Bonus points will be deposited into your account 2-4 weeks after you’ve checked out from your paid stay for this offer. You must book with your member number to receive the bonus points. These points are not elite qualifying. The bonus points have no cash value and cannot be used towards a future stay or anything else. The world being the way it is, additional taxes and fees may apply. Not valid in conjunction with any other promotions or offers. Not valid for discounted or negotiated rates, groups or existing reservations. Certain restrictions and blackout dates may apply. Finally, Kimpton Hotels reserves the right to cancel reservations booked with erroneous room rates.